. Next up for today, it’s a somewhat silly superhero – but then, if incarnations of ancient myths, national symbols, and heavily-commercialized representations of holidays can appear as superheroes, why shouldn’t legends of other kinds get a chance?
. It’s really hard to say why super-villains do some things – and attacking Graceland seemed particularly senseless. Still, this was the Monster, and nothing it ever did seemed to make much sense.
. Jaren Henderson, a thirty-eight year old security guard at Graceland, impulsively reached out from behind a sheltering wall to pluck Elvis’s (supposedly) favorite guitar from the rubble – and abruptly became a channel for the accumulated psychic potential wound about the image of the King.
. That legacy was enough to drive the Monster off.
. Since then, The King has appeared in Memphis on several occasions when the city was under attack – and has been lured out a few other times with reports of riots or of rabid fans who wanted a performance. Most of those fans recognize that “The King” isn’t really Elvis Presley – but he’s a pretty good memorial, and it isn’t every Elvis impersonator who has super-powers or is actually almost as good a performer.
. Over the last few months, Jaren has quickly built up his personal talents to the usual limits for a competent normal – although the limitations of the Legacy prevent him from going further. Similarly, the Legacy itself is fixed and unchanging; while the legend of the first and greatest One True King of Rock and Roll endures, so shall the Legacy of the King.
. Personally, Jaren a fairly ordinary guy – brown hair, brown eyes, a bit short, in good (but not fabulous) shape, and a competent security guard, but no fabulous martial artist or expert. Of course, thanks to the Legacy’s shapeshifting power, as The King he’s a near-exact duplicate of Elvis at the top of his form. He finds the whole thing a bit bemusing, but the managers at Graceland simply did repairs, stuck one of Elvis’s other guitars in the exhibit, marked off the original as a casualty of super-villain attack, and collected the insurance – so there’s no urgency about returning the guitar when he can help out with it elsewhere.
. Run: 6″, Swim: 2″, Jump: 4″, Lift: 151½kg/459½kg.
. The Legacy of the King; Independent: -2; Only in Hero ID: -¼; OIF (Guitar): -½; Side Effects: 60/All, -1; Generic Limitation (Side effects cannot be avoided): -½. As a unique item, the Legacy is indestructible.
. 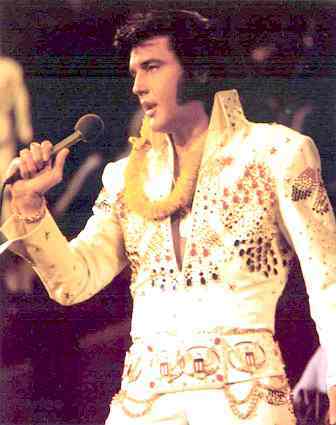 The inescapable side effects of using the Legacy of the King include the user becoming compulsively heroic, noble, chivalrous, and honorable, believing himself to be truly channeling Elvis, endlessly quoting Elvis, becoming unable to be sneaky, losing access to any other special powers that he or she may have beyond those available to Competent Normals, being hunted by an assortment of villains, and whatever else seems appropriate to a total of about 200 points. The legacy itself cannot be upgraded. c-27 Force Field (15 PD/15 ED); Half END (1 point per phase): Half, +¼.
. Attribute Boosts: +40 PRE (40), +8 REC (16), +8 STR (8), +15 COM (8), +23 CON (26), +20 EGO (40), +10 DEX (30), +5 BODY (10), +1 SPD (10). u-7 Summon Security Guards, Rabid Fans, Firemen, or similar (32 x 50-point creatures); Range: 0; Summon: Limited Group, +¼; 8x one-minute Charges +¼. u-7 16d6 Energy Blast/Sonic Riff; Range: 500; Versus: ED; Half (4) End +¼. u-7 4d6 Energy Blast/Soothing Lullaby; Range: 500; Versus: ED; Area Effect (Radius): 16″ radius, +1; Increased Area: ×2, +¼; Selective Target: +¼; No Normal Defense (Deafness, Berserker, Sealed Power Armor Suit): +1; Zero END: +½; Continuous: +1. u-7 15″ Teleportation/Never Late for the Show (Long Range 15,000″); Increased Range: ×1000, +50; Long Range: 15,000″/18.64 Miles; Mass Multiplier: ×16, +20, costs 3 END to use. u-5 3d6 Mind Control/I’m the star. Witnesses will tend to focuse on The King, and ignore and forget revealing bits – like clues to secret ID’s – about other heroes; Communication: Telepathic, +¼; Continuous: +1; Reduced END: Zero & Persistent, +1; Invisible: To All Senses, +1; Area Effect (Radius): 32″ radius, +1; Increased Area: ×4, +½; No Normal Defense: +1; Generic Limitation (Single command only; Focus on me, ignore other details): -½.
u-7 Overwhelming Musical Excellence: +5 levels w/This Attack (10) plus 4d6 Stun Only Energy Blast; Range: 450; Versus: ED; Area Effect (Cone): 26″ long, +1; Increased Area: ×2, +¼; Penetrating: +½; Reduced END: Zero, +1; Autofire: 10 shots, ¾.
u-7 Force Wall / Can’t Nobody Stop the Show (16 PD/16 ED); Range: 500; Width: 20″, +0; Half END +¼ (4 END per phase). u-5 Anywhere I Am, There’s A Concert; Generic Limitation. Combines: Knowledge of Music, 24-, Perform Music 24-, Seduction 25-, Images/Special Effects and Backup (Hearing, Sight, 4″ radius), Observer PER Penalty: 0, Half END +¼. Costs 1 End per phase. u-2 Everybody Knows the King; Knowledge/Elvis Presley 11- and Musical Performer 11- with Area Effect 48″ radius, +1; Increased Area: ×8, +¾; Usable By Others: Simultaneous Use, +½; Reduced END: Zero & Persistent, +1; Uncontrolled: +½; and Continuous: +1.
. The Legacy has a total cost of 80 CP – or would if it wasn’t independent. -1/2 Variable Limitations: various OAF’s, -1 Conventional Technology Only limitation. u-1 2d6 First Aid Kit: Aid to all damaged powers and attributes (+2) (Fade/turn, Max. 12); Range: 0; Only restores lost characteristics and powers: -½; 12 Charges: -¼.
u-1 Flares: Change Environment/Brightly Lit (32″ rad. ); 6x one-minute Charges: +0. u-1 2d6 Heavy Pistol (RKA); Range: 150; 4 Clips of 8 Charges; +0. u-1 3d6 Pepper Spray: Flash (Smell, Sight); 12 Charges: -¼; No Range: -½. Net Costs: Characteristics 32, Skills and Powers 68, Base 50, Disadvantages 50. Total = 100.